The use of cauliflower instead of rice brings a lightness, as well as a unique flavour and texture. It is great as a side or a main dish. Cook onions in a large frying pan on medium until soft. Grate the cauliflower on the large side of your grater or mill. Add cauliflower, zucchini, garlic, ginger, cayenne pepper and tamari to the onions. Cook for 8-10 minutes, stirring occasionally until the carrot is just soft. Add lemon juice, coriander, coconut cream and season. Serve with a drizzle of olive oil. Enjoy! 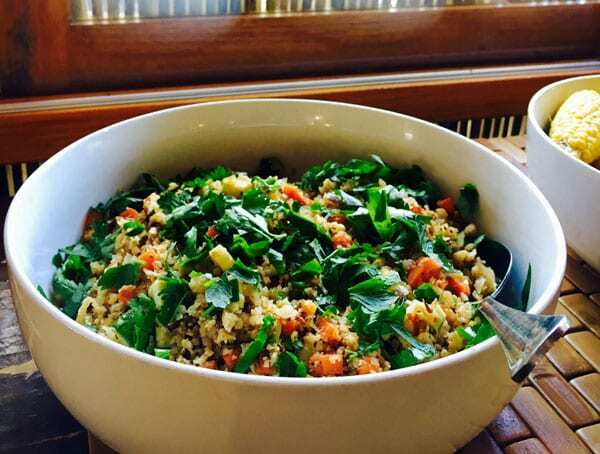 If you would like to try some of her wonderful nutritious food, book into a relaxation & yoga retreat and enjoy Angie’s lovely organic vegetarian delicious meals!